Until recently, I had only visited Philadelphia once before as a teenager. Additionally, I had only tried one of big time Philly restaurateur Stephen Starr's many restaurants, and that was actually Buddakan in New York City. It's one of my favorites, and for a long time I had been hoping to try more. The perfect opportunity came when I planned to stop by Philadelphia for a quick visit after spending a few days in New York. 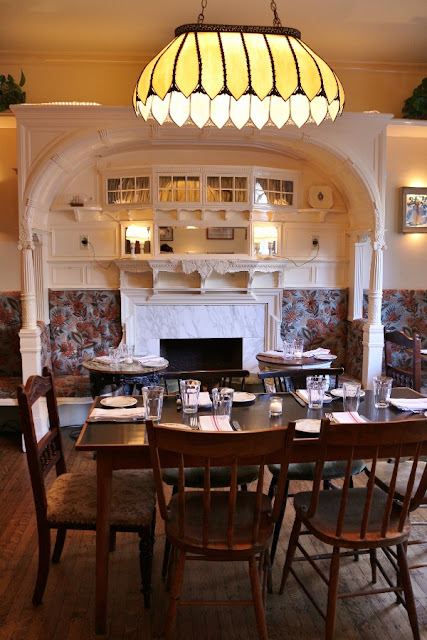 My best friend recently moved there with her husband, and when we began to formulate plans for my brief time in Philly, they quickly put one of their favorite local spots at the top of the list: The Dandelion. 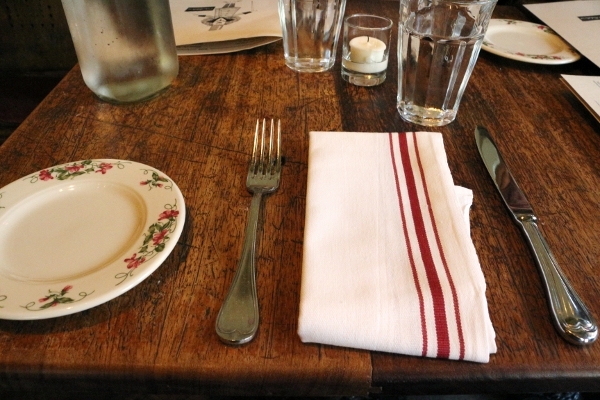 We considered it for either dinner or brunch, as both boast enticing menus. In the end, we decided to head there for Saturday dinner. 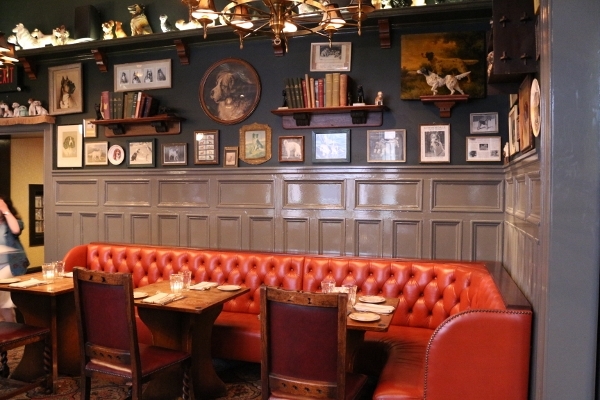 Located a block away from Rittenhouse Square, this gastropub features three floors of dining rooms and bars, each designed with unique themes including a canine-inspired bar on the upper level. 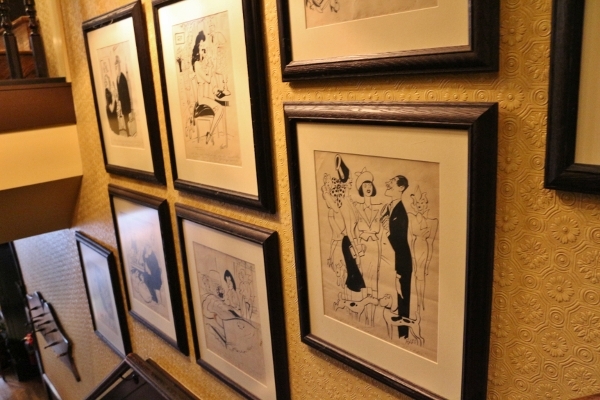 During our visit, I took a little field trip to the other dining room spaces to check them out and take some photographs. I immediately fell in love. Head over heels. 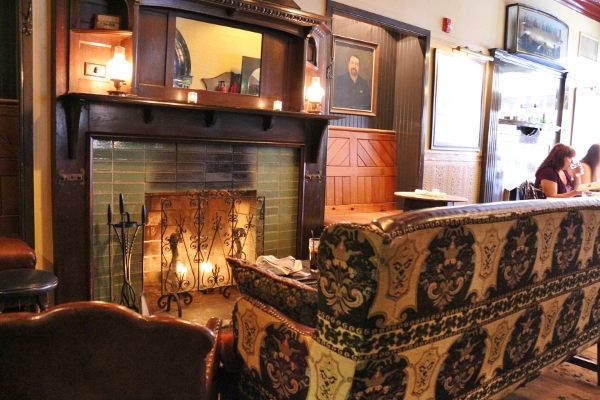 I can imagine how a meal in any of these individual sections of this cozy restaurant can inspire completely different experiences from the others. 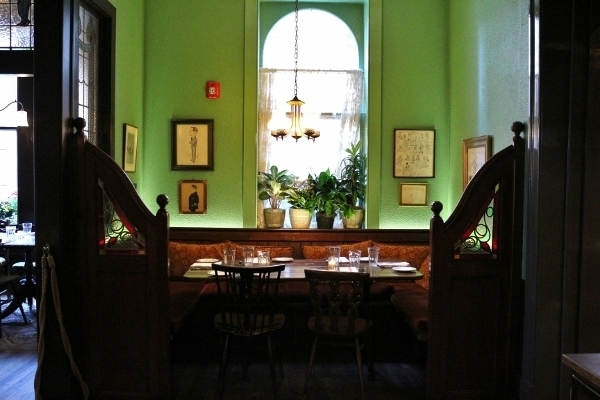 If I lived closer or visited Philly again, I would love to come back and sit in another themed room. 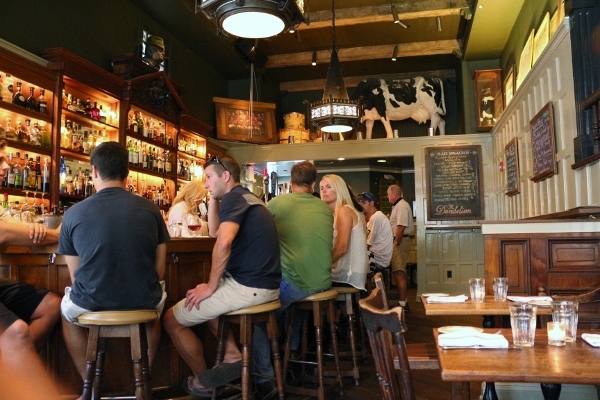 We arrived for an early dinner at The Dandelion, and although most of the dining rooms were sparse, the bar was already kicking and there were more and more people filtering into the restaurant throughout our meal. 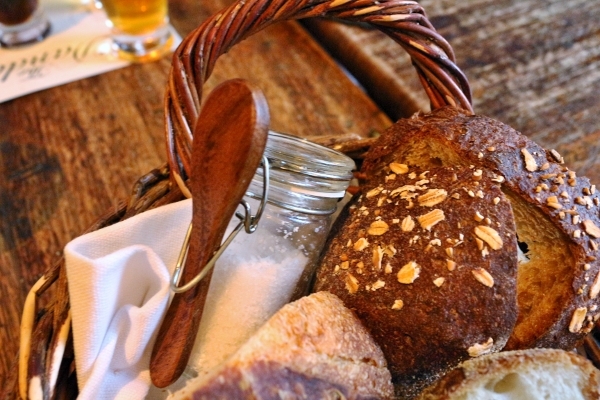 I love the little bottle of salt with the wooden spoon that accompanies the bread baskets! 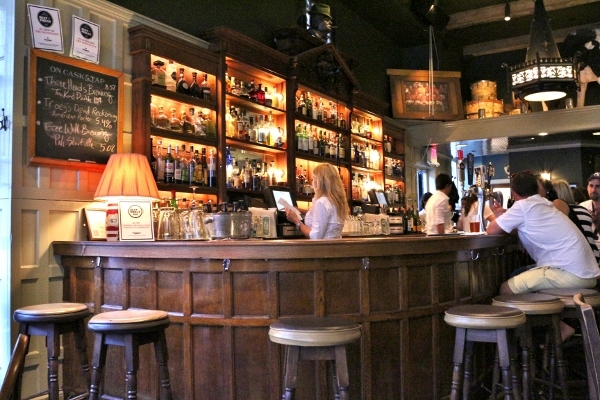 We were actually seated on the first floor, close to the main bar and the front door. The hostess area is up a few steps from the bar area, and features a fireplace, sitting area, and a long table. 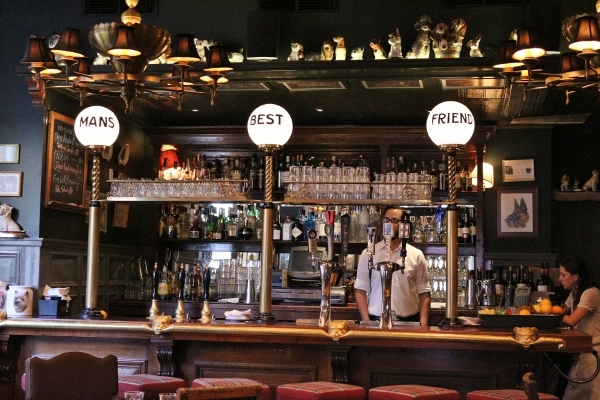 The upper level features a few very differently themed spaces, including the "Man's Best Friend" bar and canine-themed room. 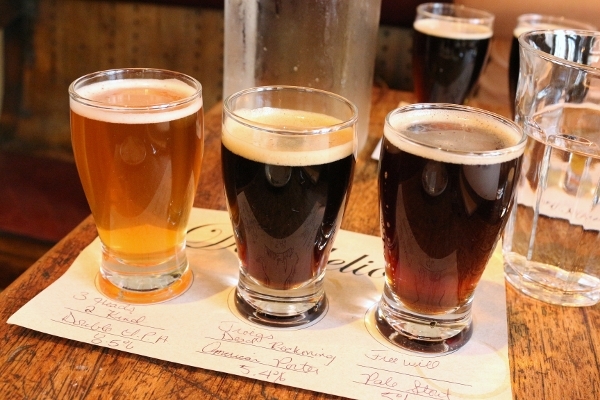 The Dandelion features rotating casks of beers that are featured in beer flights. During my visit the three casks available, and included in the flight, were Three Heads Brewing Too Kind Double IPA, Troeg's Dead Reckoning American Porter, and Free Will Brewing Pale Stout Ale. My favorites were the latter too, which I found interesting because I tend to shy away from typical darker beers. I actually found the IPA to be more bitter than the porter and stout, and expected the opposite. We selected a couple starters off the seasonal menu. The first was the Beef Tartare. It features a green salad, roasted shallot vinaigrette, truffle dressing, all on a sourdough toast. 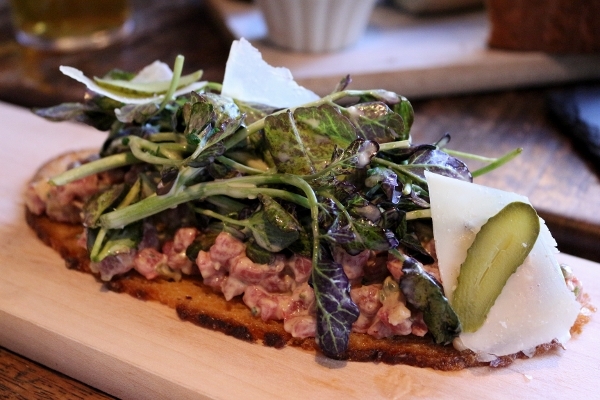 It's definitely a more rustic spin on a traditional French tartare, but it packs great flavor and freshness. The greens on the current menu say watercress, but they definitely weren't watercress when we dined there. I can't recall what they were exactly, but they definitely added a brightness to the dish. 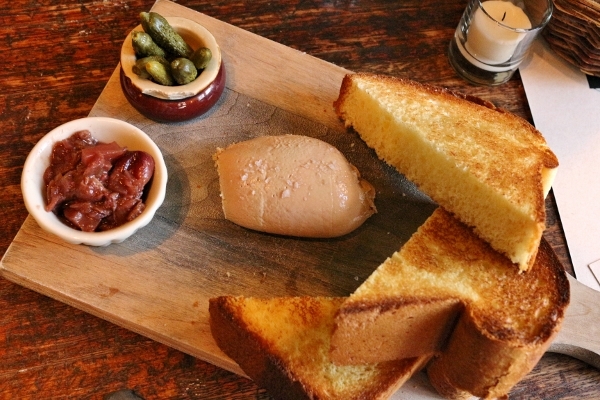 The pièce de résistance here at The Dandelion has got to be their Chicken and Duck Liver Parfait. 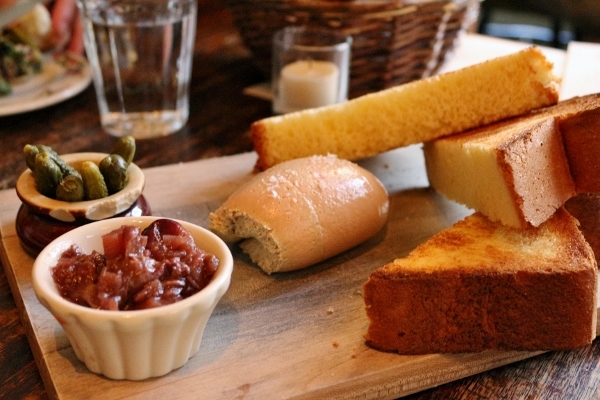 It is the essence of the term "meat butter," and is served with a sweet grape chutney, cornichons, and brioche toast. It is utterly sublime. It has got to be one of the best pâtés I've had in a really long time. Silky smooth, with a perfect richness that balances out with a touch of sweet chutney or tart cornichons. Slathered on pieces of brioche, it makes my heart stop. I could definitely get used to this! I'd even consider selling my soul for the recipe. Just saying. I actually had selected my entree even before arriving for dinner. 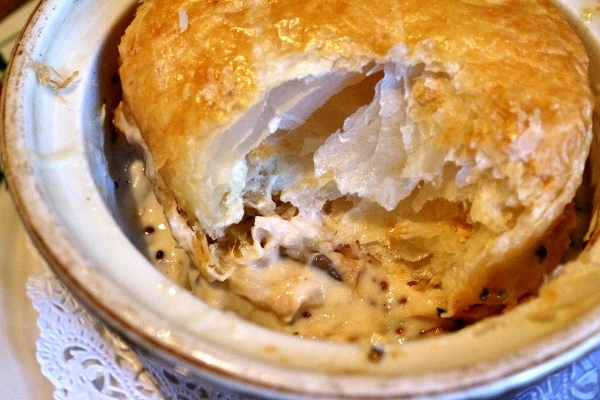 When I looked at the menu online, I knew immediately that I would be trying their Rabbit Pie. Whenever I see rabbit on a menu, I squeal with excitment. It's often rare to find, but when I see it, I jump on it! Bites of tender rabbit are simmered with oyster mushrooms, cipollini onions, smoked bacon, grain mustard, and white wine to create this decadent and comforting dish. 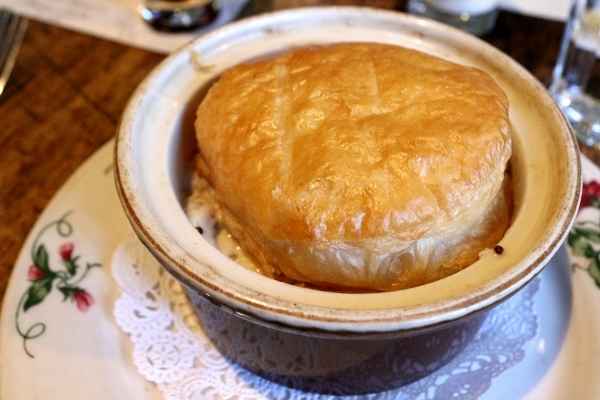 A mile-high disc of buttery puff pastry tops this twist on a typical British savory pie. I loved every bite. It's a favorite of one of my friends too, and he ordered it again during this particular visit. I can see why! 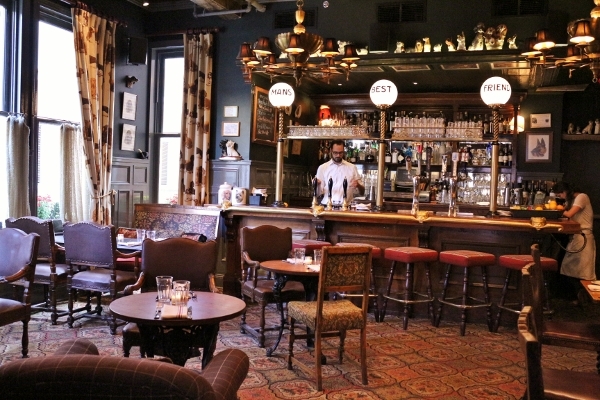 I'm always happy to expand my horizons, and gastropubs are all the rage these days. 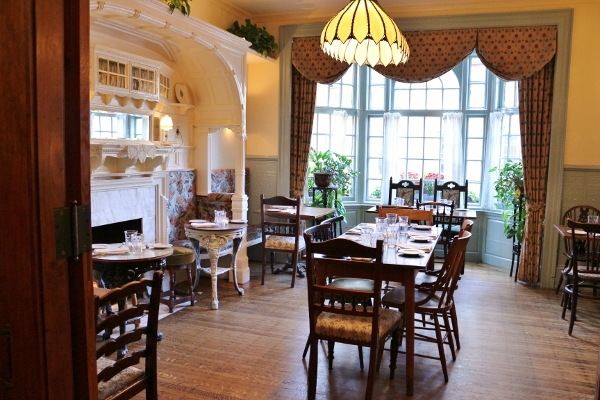 The Dandelion takes the very best of a traditional British pub and adds a bit of gourmet flair. 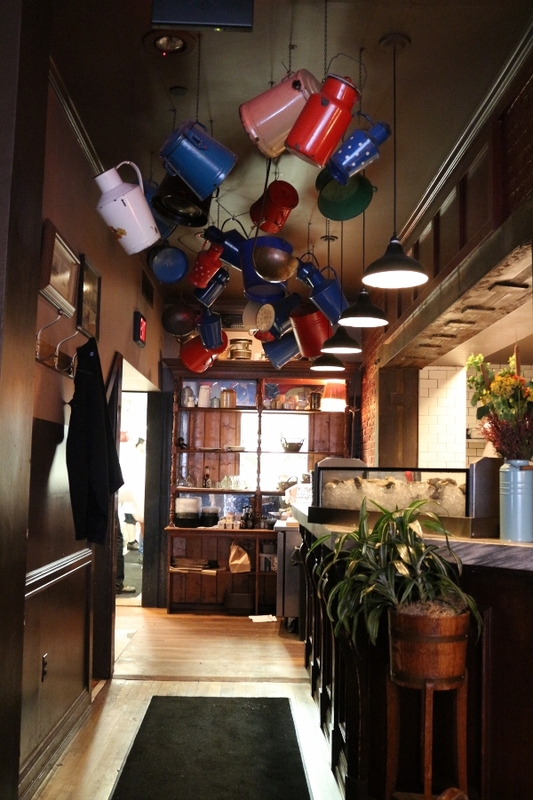 The space is cool and comfortable, the staff is friendly and knowledgeable, and the food is outstanding. I'm really glad my friends introduced me to their favorite neighborhood spot. It may only be the second of Stephen Starr's restaurants I have tried, but so far, I love what I see and can't wait for more.